Anybody would love Alaska. Any wise traveler would also love Alaska and will not forget to bring BackCountry Navigator's Alaska BLM maps to get the most from the beauty of the place and not waste time in getting lost. Alaska is magical and wonderful. It haunts those who had seen it to return and be with the magnificence of the place again while it beacons those who had never been to her land. Alaska, the Land of the Midnight Sun is one of the most beautiful places to be in the world. Managed by the Bureau of Land Management, its land size is approximately 75 million acres of federal public land. 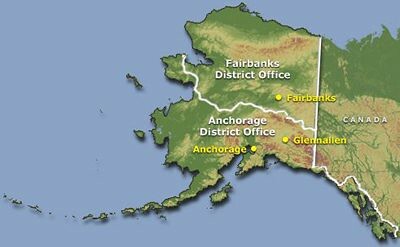 BLM Alaska divided its land management into two district offices, which are Fairbanks and Anchorage. BackCountry Navigator, the number one GPS app in travel category, has its own Alaska BLM maps available as an add-on purchase to BackCountry Navigator PRO. It can be accessed by going to "purchasing add-on" menu. While a cell phone may help in an emergency, do not rely on your cell phone. Cell coverage outside established towns may be poor or unavailable. This important information gives emphasis on the importance of bringing an Android GPS phone, with a GPS app that can read BLM maps of Alaska in offline mode like BackCountry Navigator. Safety precautions including lack of cellphone coverage in Alaska's famous recreation places can be found here. Alaska offers a wide variety of outdoor recreation opportunities and experiences for those looking for an adventure. Whether you want a backcountry hiking alone or a guided river rafting, these experiences will reduce your stress. You'll feel good about yourself through bonding with your companions, increase your knowledge of Alaska and invigorate your tired spirit with nature. Aside from Alaska BLM maps, BackCountry Navigator would gladly share an app to its users, which can be downloaded FREE from this link. We call it GPS Airtime, which help Android GPS device users on Airplane Mode to get an easy GPS fix. Android GPS users often prefer to switch on Airplane Mode to save battery life while searching for a GPS signal. Get GPS Airtime, use BackCountry Navigator PRO to navigate the pre-downloaded Alaska BLM maps offline and save yourself from getting lost. Don't forget to taste cedar-planked wild salmon to complete your stay in Alaska.